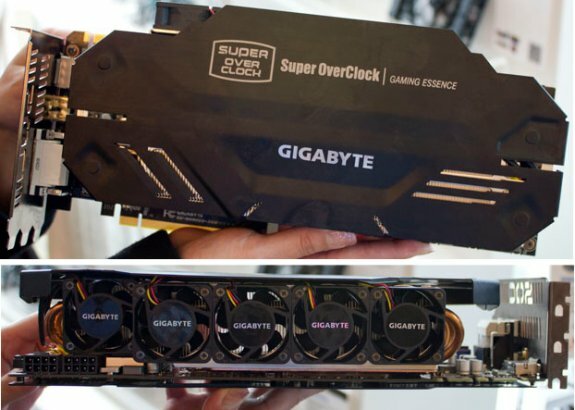 Gigabyte revealed its GeForce GTX 680 Super Overclocked at Computex, this three-slot model features a cooling solution with five fans! Rather than being mounted on the face of the cooler, the fans are located on the top edge. Clockspeeds and pricing haven't been finalized. Although the blades are small in diameter, the fans haven't been pulled from a bin of old chipset coolers. These babies are much thicker than anything I've seen bolted to a motherboard; they look like they belong in a slim server chassis. Servers aren't known for their silence, but we're told some of the fans will spin down when the card is idling.